After my hunger games manicures I needed to go back to my pastels and trying getting through my un-used polishes. So I finally picked up the color that I wanted the most out of all the spring collections. I’m so drawn to light blue, actually any blue, so when I saw the China Glaze Electro Pop collection had a sky blue I knew I had to have it. It was one of only 2 polishes I picked up from that collection and I have finally tried it out! And because I loved my last layering experiment with OPI “Rumples Wiggins” and Sinful Colors “Let Me Go” so much (click here to see that), I knew that I had to try it with this color too, so keep reading for more pictures on how this manicure eventually turned out! 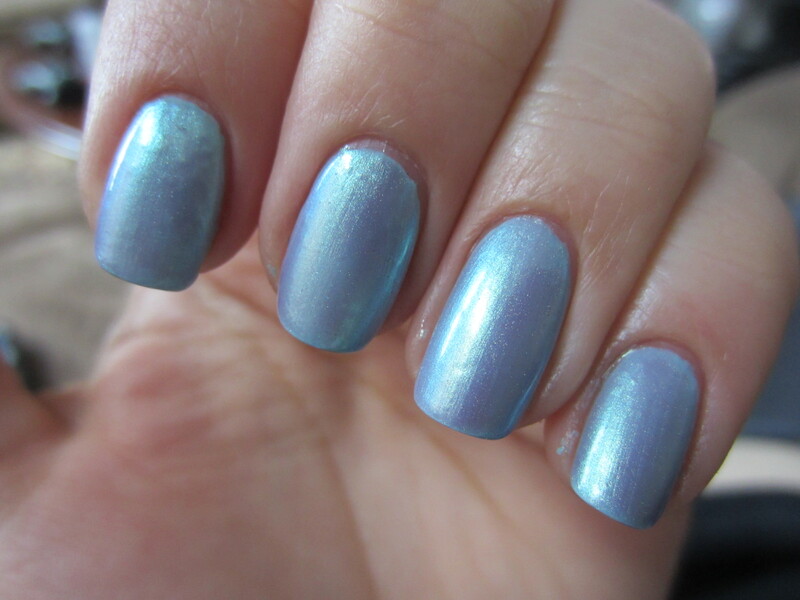 China Glaze “Kinetic Candy” is a light sky blue creme. What was surprising about this color is that it isn’t as bright or as bold as I thought it would be. I though this color would jump off my nails more, kind of like Essies “Borrowed and Blue”, which is my favorite light blue of all time. But its a muted sky blue and almost has a hint of green to it. I wore it for a little while and was craving that same duochrome combination like before so I layered Sinful Colors “Let Me Go” over top. This turned into another easter egg style duochrome! The base color was blue, from Kinetic Candy, but it shimmered to bright teal and purple in every different light. You can see on my ring finger the duochrome slightly, but in person it was a lot stronger! I always have a hard time catching the flashes of different colors and don’t want to photoshop my pictures. By adding Let Me Go, it made Kinetic Candy much brighter and a lot more prominent. It seemed to jump off my nails! Let Me Go is what I wanted Julep Melissa to be (click here to see those swatches) and was a 7th of the price. Definitely is one of my favorite polishes of all time.